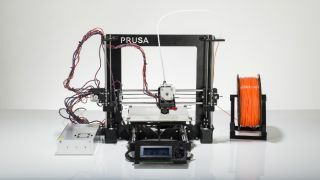 The world of 3D printing is a fast developing one, and increasingly more affordable (with options like the sub-£500 Ooznest PRUSA i3, pictured above), but it's still far from novice-friendly – although new innovations are set to help on that front, with one notable device being a handheld 3D scanner. This hardware was showed off over at the K-ICT 3D Printing Conference in South Korea, ZDNet reports, and is the brainchild of ETRI (the South Korea Electronics and Telecommunications Research Institute – the global ICT research organisation founded back in 1976). How does it work? You simply use the scanner to scan an object, and it relays the data for the dimensions and form of that object to a computer, where it can be adjusted via a simple user interface before being printed by your 3D printer. The 3D scanner and easy to use software will avoid any tricky messing with models, and will make 3D printing far more accessible, and indeed something that members of the general public will be able to enjoy (or that's the theory anyway). The GUI employed uses basic functions everyone will be familiar with, and modifying a scanned design can be achieved through, for example, simple taps on scrollbars. The 3D scanner employs multiple cameras and line lasers to do its scanning stuff, and offers a real-time preview, as well as checking elements such as an object's durability before you print the thing. There's also talk of a mini version of the scanner designed for use with a smartphone, which is essentially a budget-friendly way of turning your handset into a 3D scanner – an exciting prospect indeed. ETRI has four research locations across South Korea, and an international presence across 22 countries. The future of 3D printing certainly holds much promise, and could even be a literal lifesaver for some folks, with recent news about how medical researchers are looking into printing synthetic organs as an alternative to waiting for a donor. Scientists at Carnegie Mellon University have already used a modded 3D printer to fashion models of hearts, bones and the like from actual biological material.